O God, who consecrated that abundant first fruits of the Roman Church by the blood of the Martyrs, grant, we pray, that with firm courage we may together draw strength from so great a struggle and ever rejoice at the triumph of faithful love. Through our Lord Jesus Christ, your Son, who lives and reigns with you in the unity of the Holy Spirit, one God, for ever and ever. Grant, O Lord, that we may always revere and love your holy name for you never deprive of your guidance those you set firm on the foundation of your love. Through our Lord Jesus Christ, your Son, who lives and reigns with you in the unity of the Holy Spirit, one God, for ever and ever. This memorial is in honor of the nameless followers of Christ brutally killed by the mad Emperor Nero as scapegoats for the fire in Rome. The pagan historian Tacitus and St. Clement of Rome tell of a night of horror (August 15, 64 A.D.) when in the imperial parks Christians were put into animal skins and hunted, were brutally attacked, and were made into living torches to light the road for Nero's chariot. From 64 to 314 "Christian" was synonymous with "execution victim." According to the 1962 Missal of St. John XXIII the Extraordinary Form of the Roman Rite, today is the Commemoration of St. Paul. The Church emphasizes St. Peter's prerogatives on yesterday's feast and today recalls the special mission of Paul as Apostle of the Gentiles. There were Christians in Rome within a dozen or so years after the death of Jesus, though they were not the converts of the "Apostle of the Gentiles" (see Romans 15:20). Paul had not yet visited them at the time he wrote his great letter in A.D. 57-58. There was a large Jewish population in Rome. Probably as a result of controversy between Jews and Jewish Christians, the Emperor Claudius expelled all Jews from Rome in A.D. 49-50. Suetonius the historian says that the expulsion was due to disturbances in the city "caused by the certain Chrestus" [Christ]. Perhaps many came back after Claudius's death in A.D. 54. Paul's letter was addressed to a church with members from Jewish and gentile backgrounds. In July of A.D. 64, more than half of Rome was destroyed by fire. Rumor blamed the tragedy on Nero, who wanted to enlarge his palace. He shifted the blame by accusing the Christians. According to the historian Tacitus, a "great multitude" of Christians were put to death because of their "hatred of the human race." Peter and Paul were probably among the victims. Threatened by an army revolt and condemned to death by the senate, Nero committed suicide in A.D. 68 at the age of thirty-one. Wherever the Good News of Jesus was preached, it met the same opposition as Jesus did, and many of those who began to follow him shared his suffering and death. But no human force could stop the power of the Spirit unleashed upon the world. The blood of martyrs has always been, and will always be, the seed of Christians. Symbols: Red is the color for marytrs; red rose symbol of martyrdom; crown, symbolizing victory over death and sin; white horse with a white banner and cross and sword; fire or flames; palm, symbol of victory. Bake a special dessert, either some recipe originating from Rome, or the highlighted nameday cakes. This feast was created with the reform of the General Calendar in 1969. 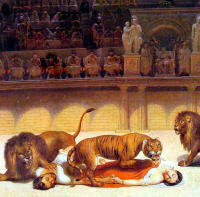 This feast celebrates the nameless men and women who were martyred in Nero's Circus in the year 64 AD.